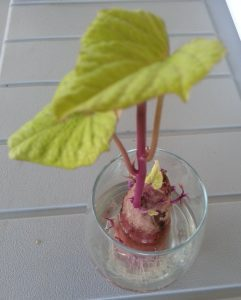 If you would like to grow sweet potatoes starting your own is a great way to begin. Sometimes sweet potato starts can be difficult to find. Plus, you can choose a variety you already know you like. Purchase sweet potatoes from the grocery store or natural foods store. If you see vegetables called “yams” they are sweet potatoes although they may be a different color of sweet potato. Sweet potato colors include pale orange to dark purple. Since you will be eating part of the sweet potato you can see if it is a variety that you like. Place the cut sweet potato in water leaving the top inch above the water. Change the water daily keeping it at about the same level every time. Watch for roots to form. After the roots have begun growing sprouts will begin to appear towards the top. Continue to change the water daily and let the roots and sprouts grow. 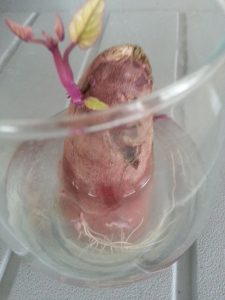 Once there are sprouts with a few leaves which have roots attached you will be able to gently separate each sprout from the sweet potato end which you originally cut. You should have more than one sprout. Plant sprout in a pot filled with potting soil – cover the roots. The pot should be about 2″ larger in diameter than the sprout. If the chance of a frost is past (about May 15 in my area) and the soil is warmed go ahead and plant directly outside or plant to a larger pot for growing as a potted plant. 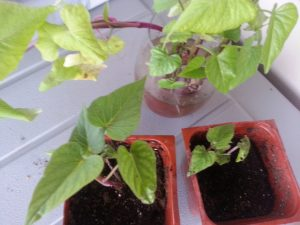 Sweet potatoes can be grown indoors or outdoors in a pot. The pot should be a minimum of 14″ in diameter. Roots can be harvested when 1 1/2 – 2″ in diameter. Sweet potatoes are not cold tolerant and can be damaged by temperatures below 50 F so watch weather reports after planting.